Sometimes when falling asleep I like to fantasize about having super powers. I can’t seem to just let myself have fun though. I tend to imagine all the ways it could go wrong. 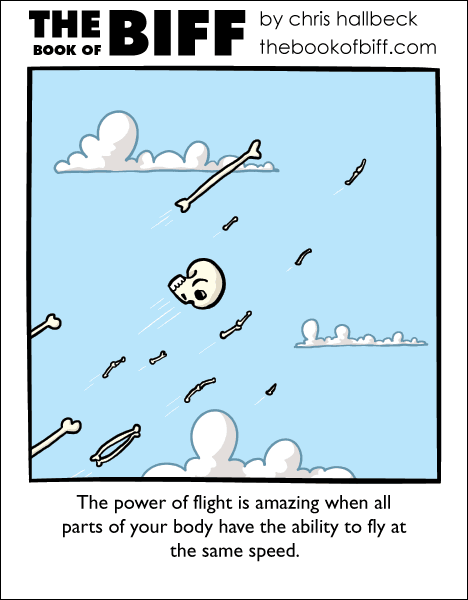 Does this mean that his skeleton can fly much faster than the rest of his body? Wow… Let’s just hope that all of his bones are going the same direction, because it wouldn’t be that nice to lose a finger bone or any other of those small ones that are easy to drop under the sofa when you take yourself apart. I think there’s a lot of meaning in that. Even Beast quoted that one in the old X-Men cartoon. FOX allowed it because why not? It’s Dickinson. Re-assembly on arrival must be very memorable to all present. Aww, Biff finally got Vashta Nerada’d!